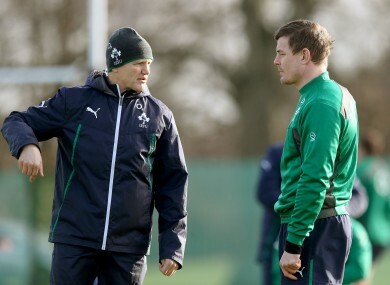 Schmidt chats with Brian O'Driscoll during Ireland training. JOE SCHMIDT IS an intriguing man. His linguistic habits are infectious, as are his rugby beliefs and approach. With the wave of optimism that greeted his appointment still very much carrying Schmidt into tomorrow’s clash with Wales, his every word remains of interest. Any glimpse into his mindset is welcome, any brief insight into how he prepares his players is gold; here is a rugby sage we can all learn from. Whether that aura remains in place may depend on results in the coming years, but right now the hints into his thinking allow us to understand what he wants from this Ireland team. There has been much mention of the word ‘discipline’ this week at Carton House from both players and coaches; Ireland have been keen to stress that their penalty count has been low since Schmidt’s reign kicked off in November. As they prepare to face a Welsh side that includes Leigh Halfpenny, the Kiwi stresses that issue again. Yeah, you’re very conscious of him [Halfpenny]. One thing I would say is that our discipline, over the four games that we have played so far, has probably been better than anyone and we’d hope that that would continue. How does that process work? Does Schmidt interrupt the flow of training sessions in order to bring his players’ attention to their disciplinary errors? “Yeah, but it doesn’t happen that often thankfully. I think, almost like dogs, you get enough repetition and you start to get into a mindset that you get into the right place at the right time and try to create the right action. With the weather outlook for tomorrow afternoon featuring plenty of rain, a match that would already have been evenly-fought looks like being tighter than ever before. Getting on the right side of Wayne Barnes and limiting their penalty concession inside their own half looks essential for Ireland. Schmidt [wearing the dark hat] prepares Ireland’s backs for the aerial threat of Rhys Priestland’s right boot. ©INPHO/Dan Sheridan. Schmidt points out that both sides will have to simplify their game plans, with accurate kicking of great importance in the grand scheme of things in Dublin. Wales’ Rhys Preistland possesses a fine boot, even if it is his ability to take the ball to the line that appears to be keeping him ahead of Dan Bigger for now. Covering Priestland’s kicking game is a large part of Schmidt’s concern, but equally important is ensuring that Ireland’s first wave of defence is solid. “You’re kind of caught between making sure your front-line is incredibly dense, well-populated and physical, then at the same time making sure you’ve got the coverage in behind. Priestland’s a very good kicker and he’s got a long, raking right foot. He gets air on the ball when he goes to look for high kicks or cross kicks. We’re going to have to make sure we cover the space in behind as well. Schmidt’s ability to recognise minor weaknesses in opposition teams is something that has been part of the narrative of his coaching ability too, with clear evidence backing up that impression of him. Unsurprisingly, he is unwilling to reveal what exactly he has seen in this Welsh team, although he does touch upon their scrum briefly. It’s something that we’ve certainly had a look at. It’s difficult to pinpoint particular things, because I think they have a lot of strengths and therefore finding weaknesses can be a little difficult. I know that they’ve been outspoken a little bit about some scrum decisions last week and I do think it’s something that they’ve made a change to. “I guess that’s one of the things that they will look to strengthen in the game coming up against us and be able to really combat that. It’s pretty hard to pinpoint the weaknesses. Man-for-man, they’re a very big side, so trying to go through them, you don’t get a lot of success. Email “Schmidt has struggled to find weaknesses amidst Welsh strengths”. Feedback on “Schmidt has struggled to find weaknesses amidst Welsh strengths”.